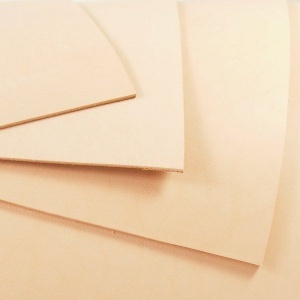 This is an A4 sized piece of veg tanned tooling leather, with a thickness of 2.9 - 3.2mm thick. It is suitable for embossing, carving and dyeing with any of the dyes available here at Artisan Leather. This is a completely undyed and grease free leather, which will be receptive to wet moulding, and is thick enough to take a deeply carved design. The surface of your tan leather can be protected with Resoline or Tan Kote once you have finished working on your design.